They install themselves, marking their territory with icons. They flash distracting, trivial alerts on the screen in front of you. They demand that you install the latest update, and they won’t take no for an answer. When you give in and install the update, they make you restart. They nag you to upgrade to a paid version. They spam you. They beg you to sign up. They’re a pain in the browser. We’ve all experienced annoying apps. In fact, some of them come preinstalled on new PCs. I did some informal polling of PC users and came up with a list of the seven worst offenders, in no particular order. In one version of AOL’s popular AIM instant messaging app, a video starts playing if you make the mistake of mousing over the upper part of the AIM panel. I can’t watch video and work at the same time, thank you. I’ve never seen a needier, more shamelessly attention-hungry Web app than AIM.The developers seem to have thought of just about every way to hound you into clicking to an AOL property or to one of its advertisers. The current version of the app looks for any excuse to get in your face. It notifies you at the top right of your screen that one of your friends has logged on, logged off, eaten a sandwich, or taken out the trash. Because I have AIM on my work PC, my home PC (a Mac), and my mobile phone, the app constantly bugs me about the fact that I’m logged in from more than one location. So what if I am? Is that a big security risk? No. I’m not discussing military secrets; most people never discuss sensitive stuff on IM, period. The alert about multiple log-ins is really just another excuse to pop a message box in front of my face and make that stupid AIM sound. I’ve used a number of different versions of AIM over the years, since my work requires it--and try as I may, I always end up upgrading to a new version, which invariably introduces a whole new generation of annoyances. Most people, however, can choose from among dozens of third-party IM apps to use. These apps readily communicate with AIM and many other clients, and they spare you AIM’s needy and annoying habits. I like the look and feel of iTunes, but the app is notoriously big and bloated, and it can take forever to start up. The iTunes Store seems big and clunky, too--and it has a similar problem with glacial loading times. 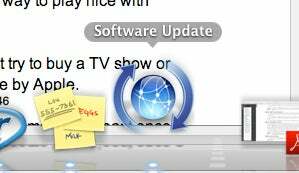 This icon bounces up and down in my Mac's dock until I give in and click on it to install the update. But Apple’s walled-garden approach to media and devices is what really gives me a pain. Apple has a long history of tying its iTunes music and video to Apple devices, making it difficult for people to buy music and video from Apple and play it on non-Apple devices. On the music side, Apple has eased its monopolistic approach in recent years, but it still doesn’t exactly go out of its way to play nice with non-Apple devices. On the video side, Apple continues to live in the DRM dark ages. Just try to buy a TV show or movie on iTunes and play it on a home-theater system not made by Apple. I’ve never seen an app that requires so many updates. It seems as though at least once a week I’m stuck looking at a “please update me” screen instead of listening to music or watching video. If you decline to accept the update, that screen will keep coming back as relentlessly as a zombie army.Oh and by the way, Apple commonly takes updating as an opportunity to sneak in installs or updates to other stuff--such as the Safari browser and the QuickTime media player--hoping that you’ll hit the Start button without opting out of those other items. Pretty tacky, Apple. Finally, when you do accept the update, you'll have to sit there for a while as it downloads and installs, and you'll have to restart your computer in order for the update to take effect.